The Metro St. Louis USAFA Parents’ Club mission is to support our cadets and their families during their time at the academy. We strive to create a sense of community within the club and to foster the development of friendships and connections between our cadets and members. Periodic treats and gift certificates sent to cadets during finals, holidays and special occasions. Birthday cards to cadets from the Club. Academy bulletins passed through the Club. An invitation to the All Academies Ball. Social and fund raising activities. Best of all, wonderful friendship and lots of fun!! 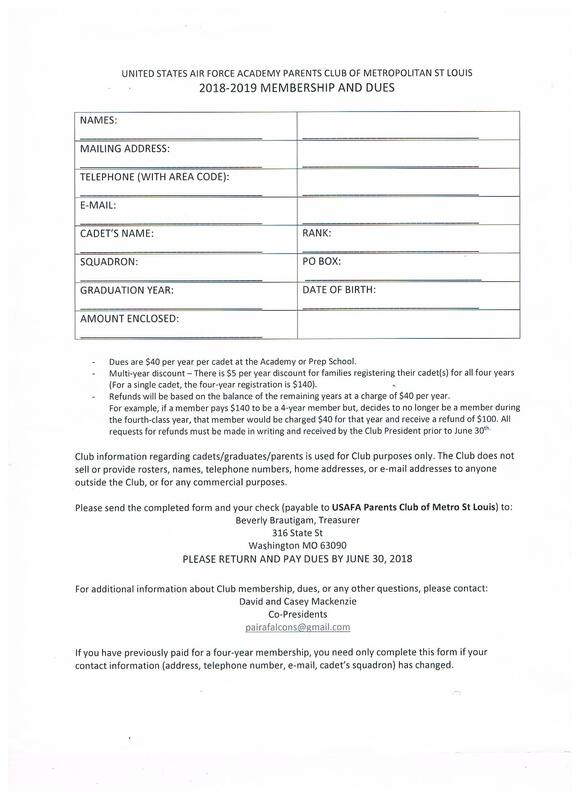 Basic membership is $40 per year for one cadet.